ARMFLEX 620 is an elegant designed supporting arm with all desirable functions needed to provide optimized comfort. The new V-Pad is shaped to provide a robust side support for the elbow and a tapered front to allow supported movement for the hand and wrist. 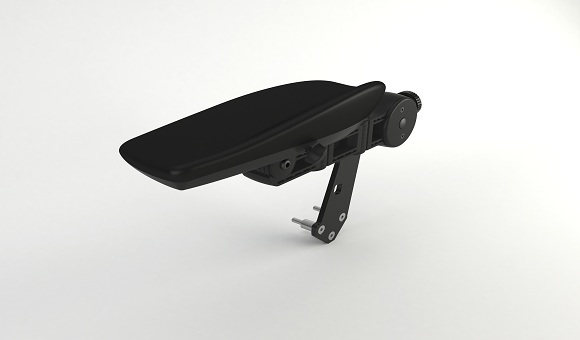 The 620 arm have its interface seat adapter as a part of its structure and height adjustment is achieved by setting the arm angle. The armrest pad is designed to provide maximum lateral support and to ensure optimal freedom of movement to operate control levers, etc. • The plastic cowling beneath the armrest pad contributes to a dynamic design and also allows any control cables to be concealed. • The armrest pad can be repositioned independently in a lateral or vertical direction, and can also be rotated horizontally. • The armrest pad also has +/- 40 mm of fore and aft adjustment. • The entire armrest is conveniently hinged to facilitate easy access to and from the seat. • The control holder for mini joysticks and certain other truck controls are available as standard components and can be mounted at the front edge of the armrest pad. Customized design solutions can be produced for vehicle manufacturers specific installations.